Heavy Duty Shop and Receiving Desks Are Used In Warehouses, Medical Facilities, Schools, Home Workshops and More. Desks are constructed of steel or stainless steel for long lasting durability. Steel channel reinforced work surface features a 2" slope from back to front. Steel ball bearing slides provide smooth drawer operation. Includes a cylinder lock and padlock hasp for secure storage. 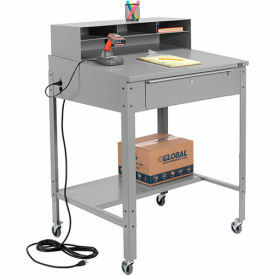 Shop and Receiving Desks can be fitted with Optional Outlet Extension (sold separately), no wiring necessary. Available styles include Shop Desk, Wall Mount Shop Desk, Shop Desk w/Pegboard Riser Shelf, Wall Mount Shop Desk w/Pegboard Riser, Shop Desk w/Cabinet Riser (wall mounted and standing), Cabinet Shop Desk and Stainless Steel Wall Mount Receiving Desk for use in Medical and Food Service industries Most styles are modular or height adjustable. Available in in Blue or Gray. Pegboard accepts peg hooks (sold separately) for hanging tools. Dimensions vary per model. Premium Pedestal Shop Desks are Ideal for Shipping and Receiving Areas where More Storage Is Needed. Pedestal Shop Desks feature steel channel reinforced work surfaces with a 2" slope from back to front. Steel ball bearing slides provide smooth drawer operation. All desks includes a cylinder lock for secure storage on both drawers and cabinets. Color finish is Gray. All Welded Shop Desk Provides Secure Storage And Organization For Warehouses, Shipping and Receiving Areas, Workshops And More. All Welded Shop Desk is made of steel for long lasting durability. Top sorting compartments provide storage for pens, pencils and more. Workbench drawers include a cylinder lock for secure storage. 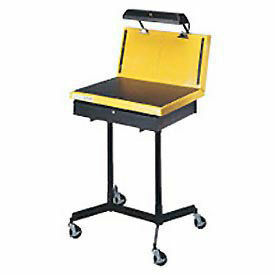 Mobile desks include either 2 swivel and 2 rigid or 4 swivel rubber casters for maneuverability. Back-to-front sloped top with retaining lip available on some models. Drawer quantities range from 1 to 8 drawers. Available colors are Blue, Dark Gray, Gray, Putty, Stainless Steel and Tan. Dimensions vary per model. 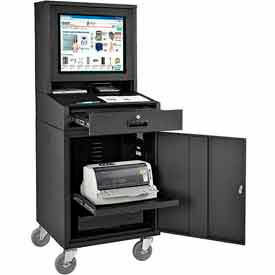 An Exclusive LCD Computer Cabinet Features LCD Monitor Storage And Convenient Writing Surface! Perfect for storing flat screen LCD or Plasma computer monitors up to 27" diagonal. 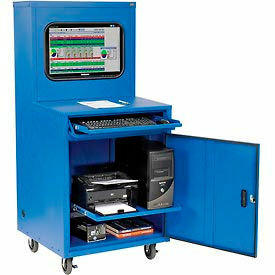 Industrial LCD computer cabinets provide optimum security to all your valuable computer equipment. Built to last using rugged 12 and 16 gauge steel with channel reinforcements for extra strength. Doors feature foam seals to keep out dust and debris. Full access door in rear allows easy wiring and is louvered for ventilation. Doors include cylinder locks for security; all locks keyed alike (1 lock on lower compartment, 2 on rear). Mobile computer cabinet includes 2 filtered air intake fans (1 in top and 1 in bottom compartment). Flat screen monitors are kept safe in top compartment with break resistant acrylic window. Features a convenient 30"W x 18-1/4"D sloped writing surface and lockable 24"W x 22"D slide-out keyboard/mouse tray with full extension drawer glides. Cable management grommet. Lower compartment includes one 23"W x 26"D height adjustable slide-out shelf that adjusts at 2" increments. Non-marking heavy duty 5" casters (2 swivel with brake, 2 rigid). Powder coat finish. Choose from our Easy-to-Assemble versions (save money on shipping and assembly costs) or save time with our Ready-to-Go fully-assembled units. Wall Mounted Fold Down Receiving Desks Create Low Profile Paperwork Storage And Writing Surfaces For Healthcare and Medical Centers, Loading Docks, Factory Floors And More. 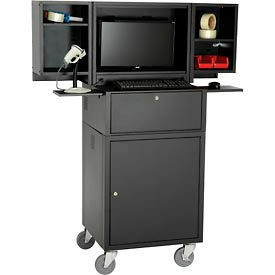 Wall Mount Receiving Desks conveniently fold away when not in use to provide optimal work space. Desks mount to wall at desired work height to accommodate stand-up or sit-down work positions. Full width handle lowers the desk to provide a convenient 13"D work surface. Includes a storage bin for charts, folders and other literature. Interior features a convenient pen storage compartment for pens, small tools and other supplies. Magnetic closure keeps door in place. Made of durable steel with a scratch resistant powder coat finish for long lasting use. Locking desk includes a cylinder lock with 2 keys for security. Available in Locking and Non-Locking models. Color finishes are Tan, Gray, and Black. Dimensions vary per model. Our Mobile Fold-Out Computer Security Cabinet / Workstation provides security, storage and mobile convenience for your computer equipment. It features two fold-out locking storage compartments that protect your monitor when not in use. When the compartments are opened, it reveals a complete workstation with plenty of storage, as well as left AND right retractable mouse trays which are great for multi-user environments. The locking middle and lower cabinet can house your computer and other peripherals. Convenient rear-door access for both of these compartments enables easy access to wiring, without moving any devices. Powder-coated steel on heavy duty 5" casters for maximum durability. Receiving And Shop Desks Provide Shipping Or Receiving Areas, Loading Docks, Warehouses And More With Proper Records Keeping. Receiving And Shop Desks are made with heavy gauge steel or stainless steel for long lasting durability. Shop desks include a slanted surface for more comfortable writing and record keeping. Available desk types include Enclosed Stationary, Pedestal Shop Desk, Open Leg Shop Desk, Stationary and Wall Mount Desk. Dimensions vary per model. Extra Wide Shop Desk Provides Large Work Space For Warehouses, Shipping and Receiving Areas, Workshops And More. Extra Wide Shop Desk is made of 14 gauge steel for long lasting durability. Top surface is 12 inches wider than most standard open-leg desks. Workbench includes two 15"W x 24"D x 5-1/2"H side-by-side drawers on ball bearing steel rollers with chrome handles for smooth drawer operation. Features 18-1/2" deep lower shelf below bench top for convenient storage. Drawers include tab for padlocking. Optional Pigeon Hole Riser or Riser Shelf available for additional storage. Optional 5" polyurethane casters available for mobility. 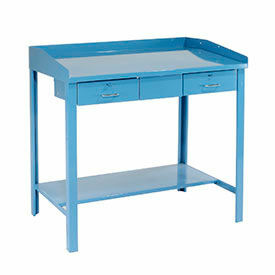 Shop desk dimensions are 48"W x 30"D x 43"H. Available colors are Blue, Gray and Putty. Shipping and Receiving Stands Provide Compact Work Site Organization To Collect, Analyze And Display Data And Documentation. Receiving Stands are constructed of steel for long lasting use and dependability. These stands are ideal for temporary receiving sites such as construction sites or temporary warehousing and give users unparalleled flexibility. Stands are low profile and mobile, depending on model. Single And Double Pedestal Shop Desks Organize And Store Files For Use In Warehouses, Factories, Shipping And Receiving Centers And More. Single And Double Pedestal Shop Desks are multi-purpose workbenches made of all welded, heavy gauge steel for long lasting durability. 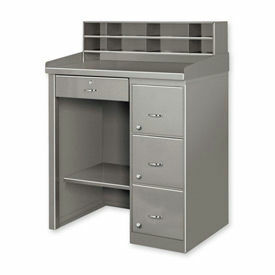 Shop desk includes a right-handed 2 or 3-drawer filing cabinet that stores letter size files. Each file drawer includes a chrome plated pull handle and cylinder lock for security. Single Pedestal Shop Desk has a locking utility drawer under the work surface and bottom shelf for added storage space. Clear acrylic over desk top surface features raised retaining lips on 3 sides and an 8-hole pigeon riser shelf with full width bottom compartment. Available styles are Extra-Wide Shop Desk and Shop Desk w/Filing Cabinet. Colors are Blue, Gray, and Putty. Dimensions vary per model. Mobile Computer Cabinet Enclosure For LCD Flat Panel Monitors Up To 24" Diagonal. 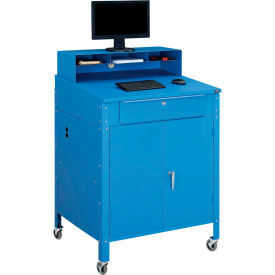 This computer cabinet is designed to hold LCD flat screen monitors and is perfect for work environments which require protection from surrounding hazards or potential vandalism. Perfect for use at construction, manufacturing facilities or for public use. 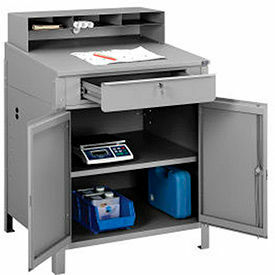 The locking monitor compartment includes a break-resistant window framed in heavy-duty steel, convenient sloped writing surface and 2 organizing compartments for 8-1/2" x 11" papers. Window panel is removable which gives easy access to touch screen monitors. Keyboard/optional mouse tray and height adjustable printer shelf extend fully on steel ball bearing slides. Lower compartment has front and rear doors. Cable management openings throughout. Rear panels are louvered to regulate heat. Moves on four industrial swivel casters (two with brakes). Powder coated finish. 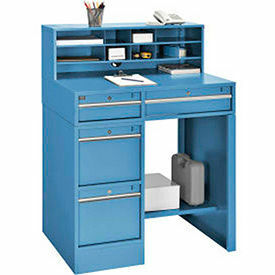 Computer cabinet is available in Blue, Black and Gray. Patent Pending. Complete Bundle Unit includes standard cabinet, 2 side shelves, 2 fans for ventilation, sliding mouse tray and 6-outlet surge protector. 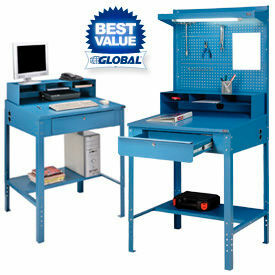 Mobile Shop Desks Provide Organized Work Area For Tools And Equipment. Mobile Shop Desks are made of heavy duty 16 gauge steel construction with durable gray powder coat finish for long lasting durability. 500 lb capacity. Drawers have ball bearing slides and include a cylinder lock and 2 keys. Swivel casters provide easy mobility. Available styles include 2 or 4 drawer desks, 1,2 ,3 and 4 Shelf Carts, Open and Closed Frame and more. Dimensions vary per style.